The Set-up: The Garten’s friend, Susan Stroman, is coming for dinner and bringing a mystery guest, so Ina is planning a menu sure to please anyone. 0:49 – We begin with Ina declaring that the First Rule of Entertaining is: get as much done as possible before the guests arrive. Let’s vote: unintentional Fight Club reference, or not? I’m inclined to say yes. 1:17 – She’s making Cream of Wild Mushroom Soup using a combination of Portobello, cremini, and Shitake mushrooms which she can prepare now and reheat later, hence rule #1. 3:38 – While the stock simmers we go into the sitting room for a little table setting lesson and some suggestions for easy entertaining. 4:14 – Entertaining Tip #1: Small, round tables help people connect. Entertaining Tip #2: Food looks best on simple white plates. Let the linens and the flowers bring in color. Entertaining Tip #3: Pre-set the dessert (in this case fresh pears and Stilton with a glass of Port) so you don’t have to leave the table. 4:34 – Ina’s suggestions make so much sense and she’s right; I am always tempted by those colorful plates, but so far I’ve managed to resist and now I feel pretty proud of my restraint. 5:21 – Okay, back to the Mushroom Soup. Ina has a French oven to sauté leeks and the diced mushroom caps. She adds a little flour to the pot to thicken the butter, then strains the vegetable pieces out of the stock and adds the liquid. A few fresh herbs and we’re done! 5:28 – I assumed because this was “Cream of…” that that there would surely be pureeing involved, but that doesn’t seem to be the case, so good news there for folks like me who prefer cooking to be as fuss-free as possible. 10:06 – Ina says the Second Rule of Entertaining is: only make two things (buy, or assemble the rest), but for the Mystery Guest she’s breaking that rule and making Blinis with Smoked Salmon and Crème Fraiche for appetizers. Rule #1 stands though; she’s making them in advance. 11:13 – Okay, now to make the batter for the blinis which are made with 1 part buckwheat flour, 2 parts white flour. Ina says these are “really like Sunday morning pancakes” and she’s right – they bubble up a little on the top and look exactly like little silver dollar pancakes. 13:17 – Once the blinis are done Ina drains them on paper towels and then fancies up with a savory topping of smoked salmon, a little dab of crème fraiche and a sprig of dill. Yum. I’ll bet this is pretty close to a bagel with lox and cream cheese. 14:22 – Apps are done, now for a quick trip to Cavaniola’s cheese shop where Ina asks for a recommendation to go with pears and port, even though she told us earlier that she was going to serve Stilton. 14:38 – For some reason she pretends like she might get something else, even going so far as to taste a piece of Five Year Old Gouda. I assume this is so we can see more of the cheese shop, which does look very nice, but maybe Ina just likes a bit of ‘cat and mouse’ when it comes to cheese buying? Pun somewhat (okay totally) intended. 15:01 – End result: Ina leaves the shop with a giant wedge of the “classic” Stilton. Surprise! 19:41 – We’re back at Ina’s now and she’s making Parmesan Chicken as the main course. She says she’s made a ton of chicken this way, and since she doesn’t know what the Mystery Guest likes she wants to go with something safe, which is a fair point. 20:08 – The process is the same as most breaded & fried chicken – seasoned flour, beaten eggs, and seasoned bread crumbs with ground parmesan cheese mixed in – but the chicken is pounded thinly so that it cooks quickly. 21:46 – Ina finishes up the frying and puts the chicken in a low oven to keep warm while she pops some champagne and pumps Susan for hints about the Mystery Guest. 23:22 – In between blurred shots of the guest arriving we get the following clues: does Broadway and films, lives in the Hamptons. This really didn't narrow it down for me. 24:09 – The doorbell rings, Ina answers and exclaims “It’s Mel!” As in Brooks, of Spaceballs, The Producers, and Blazing Saddles fame among 1,000 other hilarious things. No big deal. 24:22 – They seem to already know each other and Mel is greeted with a big hug. It takes him approximately 4 seconds to go from hopeful inquiry about a free meal, to questions about dessert, to bellowing a Brooksian “I LOVE YOUUU! !” as he follows her into the house. 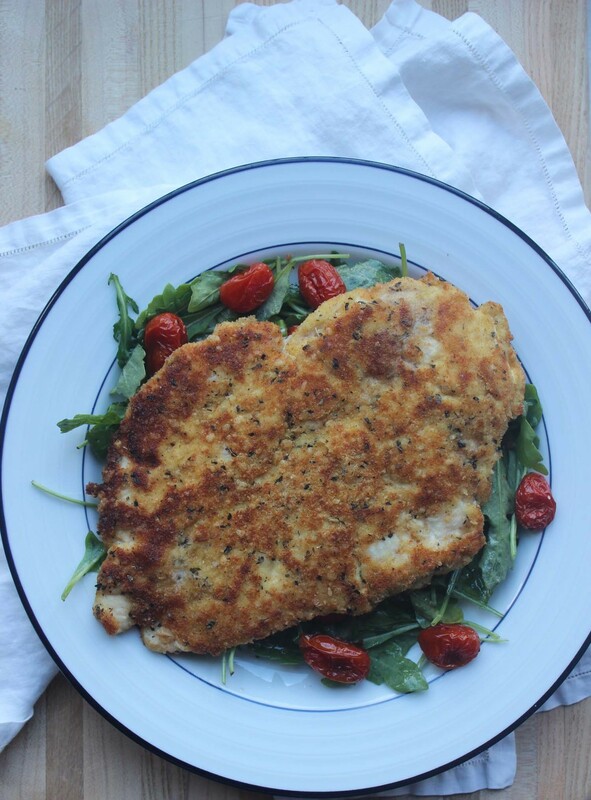 28:02 – Ina escapes to the kitchen to whip up lemon vinaigrette for the salad she’s pairing with the Parmesan Chicken. She jokes that it’s a good thing she did so much in advance because she “can’t leave that crowd alone too long.” I believe it – that Mel is an Instigator with a capital I.
I love it when Ina tells us not only how to cook something, but also how to make sure a dinner party goes smoothly too. So many good suggestions and tips in this episode. The more I watch the Barefoot Contessa, the more I see how with just a small change (buckwheat flour + salmon vs. buttermilk flour + strawberries) a familiar dish like pancakes becomes something totally different. Ina looked like she was going to fall out of her chair laughing at various points – I’m guessing Mel Brooks x Champagne = hilarity for all. Lessons Learned: Normally I’m not really into cooking for just myself, but Parmesan Chicken is really easy to portion for a solo dinner. I just added a little arugula salad and some Roasted Cherry Tomatoes and dinner was done! As always, Ina is so spot on with her cooking time, 3-4 minutes per side and a few minutes in the oven resulted in perfectly cooked chicken. One thing I did have keep an eye on is the seasoning. I’m not sure I’ve ever said this about an Ina Garten recipe before (normally I think her ratios are perfect), but I thought the chicken was a touch bland. Maybe it was my breadcrumbs, or a particularly mild piece of Parmesan? In any case, next time I will probably lightly salt & pepper the chicken before I dredge through it the flour just to make sure. This recipe is moderately small kitchen friendly. It only uses one large sauté pan, a sheet pan and basic kitchen tools, like measuring cups and a spatula. However, it does require enough counter space for three dredging bowls and a food processor (or at least a box grater for the Parmesan cheese). It also assumes that you have a wooden rolling pin or meat mallet for flattening the chicken. If your kitchen tools don’t run to rolling pins and meat mallets, but you still want to make Parmesan Chicken I’d try to buy a thinly sliced chicken cutlet as a close substitute for flattened chicken breast. The Verdict: We’re recently back from Vienna, Austria and I have schnitzel on the brain, so this recipe hit the spot with chicken standing in for pork. I really liked the combination of the crispy chicken with roasted tomatoes and arugula – sort of a lighter, deconstructed version of classic chicken parm. I think this could be a easy weeknight go-to recipe, and I definitely want to make this again for Mike to see if I can fix my seasoning issue.